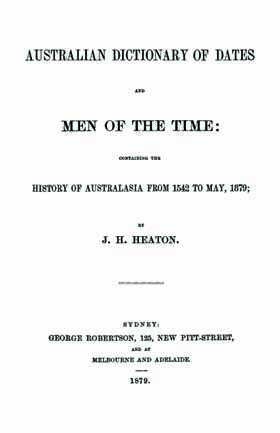 This Australian Dictionary of Dates and Men of the Time, History of Australasia From 1542 to May 1879 (J.H.Heaton 1879) was originally published in 1879. A wealth of information is contained in this 570 page book. "What information can I find in this record?" - a history of their occupations (and as to why they are 'noted' now). The entries vary in length from a paragraph to a few pages. The second part of this book is the Dictionary of Dates. This has a listing of topics (such as Aborigines, Adelaide, Aquatic, Australian Agricultural Co., Caterpillar Plague, Charitable Institutions, Church of England, Coal etc), then under each topics there is a listing of events in date order, that have happened relating to that topic. This is a great genealogy resource for anyone exploring the history of these times or their family history, or if you're putting together your family tree.